In late August 2011, General John R. Allen visited a base built atop the ruins of a 19th-century British fort here. Allen, an avid historian, grasped the irony of the setting. Over the previous 150 years, two British armies and one Russian army had left Afghanistan in frustration. Now Allen was in command of the fourth army to leave. He is the last NATO field commander, charged with extracting 140,000 international troops from combat while fighting a war with an uncertain outcome against an enemy with a certain sanctuary in next-door Pakistan. By this year’s end, Allen must reduce his U.S. force by a third without conceding populated areas. He must place Afghan battalions with uneven leadership into the breach. And he must shore up a defense-in-depth to ward off attacks launched from inside Pakistan. The decisions of John Allen, age 58, a courteous gentleman from Virginia who is virtually unknown to the American public, will greatly affect whether Afghanistan holds together or descends into chaos. On our flight to Helmand, he explains to me what he calls the “force vectors” determining success or failure. One vector is time. President Obama has pledged to withdraw U.S. troops from combat by 2014. By this year’s end, U.S. troop strength will drop from roughly 100,000 to 70,000. A second vector is Afghanistan’s political path. Afghan officials are bargaining tenaciously over the terms of the Strategic Partnership Agreement that will govern American military activities after 2014. The SPA will be critical in persuading NATO and other countries to pledge continued support. The Pakistani sanctuary is the third vector. Pakistan supports terrorists in a proxy war in order to control the eventual political outcome in Afghanistan. Conceding a sanctuary to insurgents has historically imperiled any beleaguered government. The fourth vector is instilling confidence in the Afghan army. Unless Afghan security forces can stand up to the Taliban, chaos and civil war are inevitable. The scale of his task can be illustrated with one statistic: In August, just 72 of 211 Afghan battalions were rated as effective without the assistance of coalition forces. With the number of coalition troops shrinking, Allen is racing against the clock. 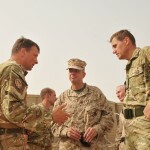 Allen is the eleventh general to command the International Security Assistance Force (ISAF). His visit to the small British base in Helmand Province is part of his twice-weekly “battlefield circulation.” When the British officers say they are recruiting villagers as auxiliary police, Allen nods in approval. Allen next meets with the district police chief, who asks for more cops. Allen points out that regular policemen cost $30,000 a year, compared with $8,000 for a village auxiliary. After the meeting with the district elders, Allen bounds off to talk with the troops of the British 45th Commando. After shucking helmet, armor, and aides, he wanders around the parapets chatting with lean, sunburned youths in T-shirts. He congratulates them on their progress and listens to their war stories. For a few minutes, he isn’t the four-star who confers with ambassadors; he is back among troops. Reserved among diplomats and distant with journalists, Allen is most comfortable among soldiers. He has twice won Marine Corps awards for leadership and has been named Instructor of the Year at the Naval Academy. His choice of the military as a career began with a teacher. As a sophomore at the prestigious Flint Hill School in northern Virginia, he fell under the tutelage of a retired British Marine with a degree from Oxford who had fought in Malaya during World War II and spent much of the war in a Japanese POW camp on the River Kwai. Allen graduated with a keen appreciation of literature and an abiding respect for proper form and discipline. His father had won a battlefield commission on board the destroyer U.S.S. Woolsey by climbing the ship’s mast to adjust naval gunfire in a duel with a German tank racing along the sands of the Anzio beachhead in 1944. Instead of Princeton, John Allen chose to attend the Naval Academy. By his junior year, he had decided to be a Marine infantryman rather than a Navy officer. Beginning in 2008, he worked as General David Petraeus’s deputy at Central Command. The two shared an intellectual, even-keeled approach. Shunning confrontations and displays of anger, both men quietly manipulated the bureaucracies to reassign those who performed poorly. When Petraeus took command in Afghanistan in 2010, Allen remained as the deputy in Tampa. After Petraeus returned to Washington in mid-2011 as director of the CIA, Allen took over in Afghanistan. At the same time, President Obama downgraded the mission of long-term nation building. Instead, he said, “it is time to focus on nation building here at home.” The new, more modest goal in Afghanistan was to prevent the reemergence of a safe haven for Islamist terrorists. 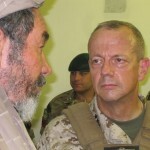 Allen was charged with transitioning Afghan forces into the lead, and the American military role would change from combat to support by 2014. “Afghans must see their army as the symbol of national unity, holding the country together,” he says. Allen works 100-hour weeks, with a third of the time spent on the battlefields and another third in discussions with his staff in his small operations center. He is focused on the battlefield and on the performance of the Afghan army and police. An executive manages what he measures, and over the course of his career, Allen has acquired a reputation for poring over reports at ungodly hours. At his bedside he keeps biographies of military commanders, including an account of how British field marshal William Slim turned defeat into victory over Japanese forces in Burma and India in World War II. He hoards eight hours a week for personal study time. In Afghanistan, Allen needed all the bright ideas he could grab. Although the northern and western parts of the country were relatively stable, insurgents had besieged the eastern and southern areas, comprising 260,000 square kilometers and 20 million people. At first, the Afghans could do little to defend themselves. For comparison, consider that Iraq — a country with the same population but one-third smaller in size — had 800,000 men under arms. Afghanistan had fewer than 400,000, and most recruits had to be taught to read as well as to shoot. The cost for that force, including pay, equipment, and maintenance, was estimated at $6 billion to $10 billion per year. Quantity is one thing; fighting quality is quite another. To accelerate the development of the Afghan army, the coalition had “partnered” Afghan and American forces in the field. The intent was to train by example. A similar technique had worked in Iraq — with two key differences: First, the Iraqi army was easier to reconstitute, since Iraq had an educated middle class. Second, the Sunni tribes in Iraq turned against al-Qaeda. Allen played a key role in that shift. While serving in 2007 in Anbar Province, then–Brigadier General Allen shuttled to Jordan to negotiate with pro-insurgent sheiks. He provided clandestine airlift, medical treatment, and bodyguards to entice them to join the Sunni tribal movement known as the Anbar Awakening. In Afghanistan, Allen was enthusiastic about expanding the auxiliary local police program from 44 Pashtun villages to 100. However, it was the surge of American troops, not the performance of Afghan forces, that stopped the momentum of the Taliban in 2011. Allen’s field army of coalition forces consists of roughly 55 units the size of a battalion (800 to 1,000 troops). Each controls a “battle space” of 100 to 500 square kilometers. Allen has to withdraw a third of the U.S. force — 33,000 of the 100,000 Americans — before September of 2012. No matter how he shuffles the remaining units, the diminished coalition force will not be able to control all key areas. Allen is quietly assigning areas to Afghan control. Allen is currently reading a biography of General Ulysses S. Grant, who in 1864 took command of an Army of the Potomac that had been thrashed by General Robert E. Lee. The Army had lost heart. Relying upon his larger numbers, Grant doggedly attacked, and the spirit of offense gradually infused the Union soldiers with confidence. It was no accident that Allen began his first letter to the troops in the style of Grant, with the exhortation, in bold type, to “relentlessly pressure the enemy.” He recognized that the Afghan security forces have similar advantages of numbers and resources over the Taliban. But Allen faces a problem that Grant never did: He cannot change his field commanders who are Afghans. His basic challenge is to get Afghan forces to take ownership of their fight: “I’m not waiting until we’re out of combat to get them in,” he says. Faced with a comparable problem in 1971, President Richard Nixon pressed his commander in Saigon, General Creighton Abrams, to send the South Vietnamese army into combat on its own, without American advisers. The ensuing battle against seven North Vietnamese divisions in the jungles of Laos, called Lam Son 719, ended disastrously. Allen intended to go the other way: Instead of reducing advisers, he wanted to add more of them. While the Afghan forces did the shooting, the advisers provided communications, fire support, and medical evacuation. Historically, advisory missions have gotten too little attention from the American military establishment. Commanding American forces has been the preferred career path for recognition and promotion. To fill the advisory gap, in the early 1960s the U.S. Army began organizing the Special Forces to train foreign armies. Each Special Forces Operational Detachment Alpha, or ODA, team comprised a dozen Green Berets skilled in tactics, communications, and medical and fire support. But there weren’t enough of them in Afghanistan. About half of the 112 ODAs serving there were used for counterterrorism raids. More than 400 Afghan-army battalions, police precincts, and district auxiliary-police units needed adviser teams. ODA teams weren’t nearly enough. American battalions were supplying the manpower for the adviser slots, but those battalions were withdrawing, and many thousands of advisers were required. To address this shortage, Allen solicited unconventional alternatives. “I don’t have the luxury to think in traditional terms,” he says. With Allen’s encouragement, the Special Forces are working together with U.S. conventional units to provide sufficient advisers for the village auxiliary-police program. Allen believes it will require several such mix-and-match task organizations to flesh out an adviser corps numbering in the thousands for at least the next few years. Some combat data suggest that, with help from advisers, the Afghan army can hold its own. This can be seen by looking at the units it will be relieving. While ISAF does not emphasize counts of enemy casualties, because they tend to be inaccurate and do not predict success in war, casualties do reflect the intensity of battle. At the end of August, the coalition’s Special Operations Forces and helicopter gunships accounted for an estimated 2,500 Taliban fatalities, while the 55 conventional battalions, which will be replaced by Afghans, accounted for another 1,600. Put another way, 10 percent of the force — SOF and gunships — contributed 60 percent of the lethality. On average, each conventional battalion accounted for one Taliban fatality each week. Within that average, though, lies considerable variation: Some battalions engaged in frequent firefights, while others engaged in none. Overall, combat was light. Most battalions conducted routine police patrols that could be accomplished with equal effectiveness by Afghan soldiers — if led by Afghan officers of average competence. Anecdotes from the front lines, however, were disturbing. On NPR, for instance, two company commanders fresh from the battlefield said that the same small minority of Afghan soldiers always patrolled alongside American soldiers, while the great majority of the Afghan soldiers remained inside the base. These commanders were convinced that Afghan battalions would cut deals with insurgents once the U.S. units withdrew. If American battalions do pull out without injecting any compensating U.S. force, the Afghan forces will most likely lose heart and fall apart. The insertion of advisers to fill this role is the heart of Allen’s transition strategy. The performance of the Afghan army on its own remains unpredictable, because it hasn’t yet been tested. Afghanistan is not large-scale combat; it’s a war of intimidation — brief fights and bombings intended to instill fear and cause the Afghan troops to pull back. Preventing that by building an adviser corps, all while withdrawing the conventional battalions, will be the most significant organizational change in the ten-year war. Last winter and again this spring, I embedded with a Marine platoon in Helmand Province. The grunts slept in rooms hacked out of a mud-walled farmhouse surrounded by corn and poppy fields. Every day we went out on patrol. Every day someone shot to kill a Marine, and the Marines shot back to kill him. Afghan soldiers took part in every patrol. I asked the platoon to rate the fighting skills of the Afghan soldiers against the Taliban. Twenty-one Marines said the Afghan soldiers and the Taliban were about equal, seven said the Afghan soldiers were better, and 17 said the Taliban were better. In essence, the platoon believed Afghan soldiers could hold their own, assuming a modicum of leadership. The Afghan army has two years to pull its act together and save the nation. Without a strong army, Afghanistan will degenerate into civil war. With a strong army, Afghanistan can deny safe havens to terrorists and preserve the nation’s fragile unity. The complexity of Allen’s task — standing up a competent Afghan security force as the coalition forces leave — is staggering. At a time when the murders of American soldiers by Afghan soldiers have eroded mutual trust as well as U.S. public support, the coalition strategy requires the continued deployment of small advisory teams vulnerable to such tactics. The massacre of Afghan civilians by an American soldier will further inflame tensions. And although Allen and Ambassador Ryan Crocker have skillfully managed America’s relationship with President Karzai, the Afghan government has yet to sign a Strategic Partnership Agreement tha t will extend a substantial U.S. military presence and financial commitment beyond 2014. Sorley begins his biography of Abrams with the quote, “He deserves a better war.” Like Abrams, Allen conveys positive leadership and thoughtful determination. Also like Abrams, he understands that in the end, no American general controls the final outcome. America and NATO cannot be expected to fight with more resolve for the freedom of Afghans than do the Afghans themselves. Mr. West is a former assistant secretary of defense and combat Marine who travels frequently to Afghanistan to report from the front lines.